If you had been on the shoreline of Portland, Oregon in April 2016 and had seen a fairly unremarkable gray trimaran cruising the shore, you probably wouldn’t have looked twice. But beneath this relatively plain exterior lies a wealth of innovative and cutting-edge technology. For this gray trimaran is Sea Hunter, an autonomous drone ship designed to patrol faraway seas for months at a time, without the need for a crew to set foot on board once it is launched. 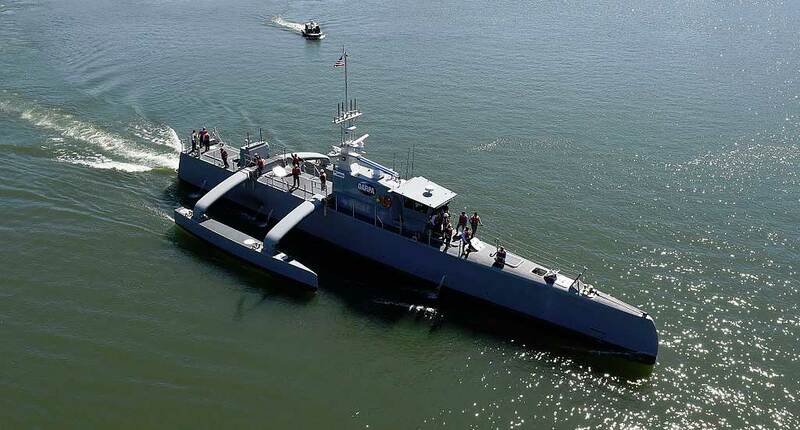 Its full name is quite a mouthful – the Anti-Submarine Warfare (ASW) Continuous Trail Unmanned Vessel (ACTUV), developed by DARPA (Defense Advanced Research Projects Agency). We’ve seen unmanned ships before, usually ones that can be launched from a larger ship and controlled via a human operator. The idea of Sea Hunter is that it is completely independent and designed to operate under minimal shore-based control, with on-board computers driving and controlling the ship. The self-navigation systems on board also mean that through the use of radar and the Automatic Identification System (AIS) that Sea Hunter can keep track of its location along with avoiding any potential collisions with nearby vessels. Sea Hunter is equipped with a dazzling array of technology, with the total cost of the build estimated at $20million. The carbon composite hull is equipped with navigation and piloting sensors, electro-optics, and both long and short range radar. It is also equipped with fuel tanks capable of holding up to 40 tons of fuel. All this means that Sea Hunter is capable of being at sea for up to three months at a time, with the primary purpose of tracking diesel-electric submarines located at extreme depths. The release of Sea Hunter comes at a time when the might of the US Navy is being challenged by the heavy investment of other countries, such as China and Russia, in their naval fleets. This includes a significant number of diesel-electric submarines. One of the main issues with these submarines is that they are extremely quiet, much quieter in fact than their nuclear cousins. This means that they are very hard to detect using normal equipment such as radar. They are also relatively inexpensive to buy and are generally used for reconnaissance missions. The proliferation of these subs has potential consequences for both global commerce and access to strategic areas of the oceans. More than 39 countries are now thought to possess diesel-electric submarines, meaning that the ability to track these stealthy little submarines is becoming of vital importance. With the US no longer in possession of any diesel submarines, in 2005 one was leased from Sweden in order to better understand how to track them. This experiment resulted in the submarine ‘virtually’ sinking destroyers, frigates, and nuclear submarines, all whilst remaining virtually undetected. This illustrates both their use, and their very real danger. Sea Hunter is presumably part of an ongoing strategy to better defend the US Navy against these submarines, and in terms of affordability it is far superior to alternative options. Sea Hunter is capable of patrolling the oceans for $15,000 to $20,000 per day, compared to the $700,000 per day it takes to operate a Naval Destroyer. Whilst Sea Hunters capabilities and technology may be cutting-edge, the inspiration behind the structure of the ship itself draws inspiration from a far older source. One important aspect of this autonomous vessel is that it must be capable of remaining functional in some remote and fairly rough seas. With this in mind, the inventors of Sea Hunter drew on the designs of classic Polynesian outrigger canoes. The narrow, 40 meter long body is designed to slip through the waves with hydrodynamic ease, whilst the outriggers, also known as ‘amas’, provide a steadying influence. The stability of this design in rough seas is due to the distance between the individual hulls, as opposed to the hull shape itself. Sea Hunter is therefore easily capable of not only remaining fully functional in Sea State 5 (six foot waves) but also maintaining operational capabilities up to Sea State 7 (waves of up to 20 feet). Its top speed of 27 knots per hour (31 miles per hour) is designed to outstrip that of the submarines which it may be tracking. Currently Sea Hunter is most definitely unarmed, although the Manager of the ACTUV program at the time suggested that arming the ship could well be a consideration for the future. If that was to be the case though, the decision whether or not to use lethal force would always be made by a human being. Whilst Sea Hunter was initially designed as an unmanned tracker for submarines, now that its full capabilities are becoming apparent, it looks as though the Navy anticipate employing it for a wide range of different missions. Sea Hunter is in a testing period until 2018 and we can look forward to seeing this independent little ship making some big waves in the near future.